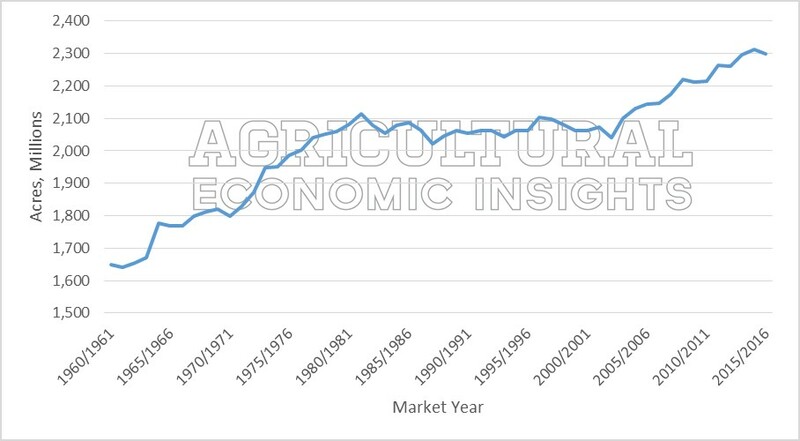 Agricultural Economic Insights What in the World is Going On With Acres? Last week we looked at how the increase in acreage of U.S. principle crops contributed to abundant grain supplies. The basic point was that increased acreages and strong yields have helped to produce abundant crop supplies. While the U.S. is certainly a key producer of the principle crops that we discussed, we thought it would be important to look at these trends a bit more broadly. This week we examine how world harvested acres have changed. As we noted last week, U.S. farmers responded to higher commodity prices by producing more commodities. One of the primary ways that they did this was by increasing cropland acres. While U.S. farmers clearly got with the program, farmers in other countries did as well. Figure 1 shows world harvested cropland in millions of acres for 13 primary crops from 1960-2015. As you can see world crop acres have expanded significantly over this time period. In 2015 world harvested acres of these crops stood just short of 2.3 billion acres. That is a nearly 40% increase over the levels of 1960 when farmers harvested 1.6 billion acres of these crops. More recently, since 2000 world harvested acreage is up by 236 million acres or 11%. Figure 1. Total Acres Harvested (World), 13 Primary Crops. 1960- 2016 Marketing Years. The increase in world harvested acreage is large. To put it in perspective, in 2000 North America harvested a total of 319 million acres of these crops. So in other words, in 15 years the world added an acreage just about two thirds the size of the North American harvested acreage. At the same time productivity has also been increasing, but we will save that for another post. The largest contributor to the increased acreage was South America which has increased harvested acreage by an amazing 86 million acres. The South Americans were followed by farmers in Sub Saharan Africa which added 57 million acres, countries in the Former Soviet Union whose former members added 42 million acres, and East Asian countries chipped in another 16 million acres for good measure. The bottom line is that the acreage increases around the world have been substantial. So Does it Go Away? When looking at the chart a couple of things stand out. First, harvested acreage has undergone two periods of major expansion. In our opinion it is not coincidental that both of the major moves upward corresponded to significant demand shifts. The first coming in the 1970’s as export markets opened up and demand increased, and the second in the mid to late 2000’s with the development of widespread use of biofuels and increased demand for commodities in emerging markets such as China. Second, once commodity supplies caught up with demand and commodity prices fell, harvested acreages were flat until the next commodity demand shift. The second point is perhaps the most important. Once the acreages have been added, they only leave production very stubbornly. Since 1976, harvested acres have never been below 2 billion acres. Further, from the first peak of 2.1 billion acres in the 1981/82 marketing year harvested, the most harvested acres have fallen is 92 million acres in 1987/88. On the other hand, harvested acres did not surpass the 81/82 peak until 2004/05. So the bottom line seems to be that acres only increase or decrease stubbornly. However, once they are in, they don’t tend to go away willingly. As David pointed out last week, the U.S. has expanded its acres of principle crops. The increases in the U.S. occurred through the elimination of acreage reduction programs and a decline in CRP enrollments. The acreage increases in other parts of the world are very significant as well. The increased acreages combined with several years of strong production have served to build crop surpluses. During the last major economic downturn in the U.S. the government played a key role in reining in and reducing acreage through set-aside and the CRP program. While a set-aside program like that seen in the height of the farm crisis is unlikely, expansion of the CRP program would serve to buffer some of the increases that we have seen in crop acres. It is likely that taking the CRP program back to its higher levels would have a significant impact on commodity prices. In addition, government policies and the economic environment in other countries can also have an impact on harvested acreages. However, if the period following the last major demand shift is a guide to the future, it appears we won’t see a major reduction in harvested acreages anytime soon. In simple terms, we have built a bigger agricultural factory and currently it is humming along and able to meet demand. In order to improve prices, either the factory will have to have a few production hiccups or demand will have to pick up.